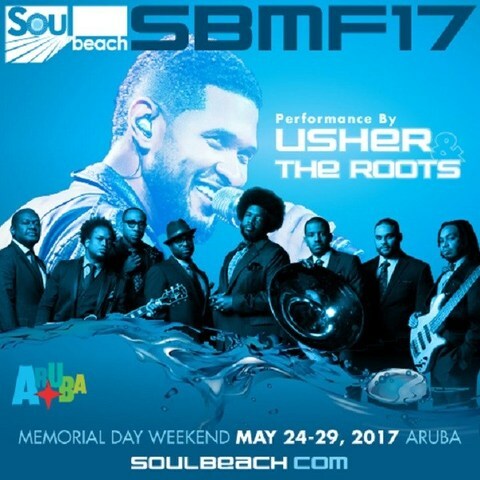 The 17th Annual Soul Beach Music Festival in Aruba | May 24th - 29th, 2017 - TheUrbanMusicScene.com | Concerts & Festivals! ORANJESTAD, Aruba, Dec. 16, 2016 /PRNewswire/ — Feel the breeze and ‘get caught’ up with the 17th Annual Soul Beach Music Festival hosted by Aruba, featuring multi-award winner and worldwide phenomenon Usher and prolific Grammy award-winning icons The Roots, set to deliver amped-up main stage concert performances sure to make spirits soar this Memorial Day weekend, May 24-29, 2017. Soul Beach Music Festival, previously named #4 by USA Today readers’ choice “10 Best Caribbean Celebrations” and #1 “Caribbean Summer Festival” by Jetsetter Magazine, boasts a truly unique and unforgettable three-in-one experience featuring live music performances, comedy shows and beach parties. Festival goers will immerse themselves in Aruba’s majestic oasis of culinary prowess, catch the rays of serene escapes and bask in the glow of a paradise just as beautiful as the people who inhabit it. Follow us on Twitter and Instagram @SoulBeachMusic and become join us on 2017 Soul Beach Music Festival on www.Facebook.com/soulbeach.com.